One of my recent tasks was making a new skin for one of our websites. 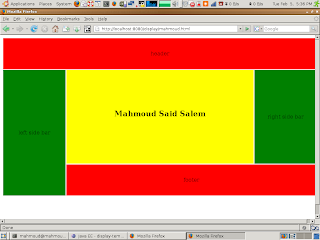 the site had a common header, left side area and right side area that are to be shared among all pages. we used to include file for "header", "left side", "right side" in each of the pages.. it wasn't that pretty i know. I wanted to think of something better where i can define the template in exactly one file and i do not have to include that file on every new page i add. something pretty much close the RubyOnRails "' directive to import the page content inside the template. i finally managed to do it. what we want is to have each of the two pages displayed in a layout where is one header, banners and so. which will look like the following. 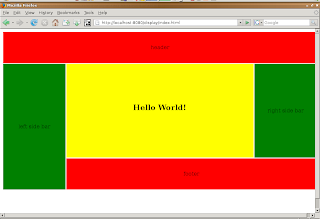 I was able to do this using a servlet that intercepts the request. 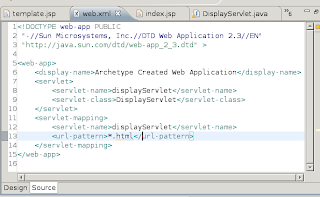 and loads the template jsp file and pass the desired page to as a parameter to be included. 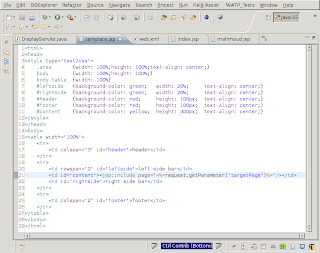 The only line that matters in the template code is where we make the jsp:include page=""
A note to be mentioned is that I had to configure my template to be initiated with requests to html pages (i can choose to work on any extension except jsp). When I configure my servlet mapping to be associated with jsp URLs, i get stuck in an infinite loop as since including the page inside the template results in a new jsp request. The idea is simple. You are free to create your own template and to work on any file extensions in the url, but you have to specify a type other than jsp to avoid the infinite loop trap.